His Divine Presence Avatar Adi Da clarifies that real Spiritual practice is not about “feeling good”, but an intense purification of all limits on feeling. This fire of purification occurs by coming into contact with the Pure Radiance of the Spiritual Master. 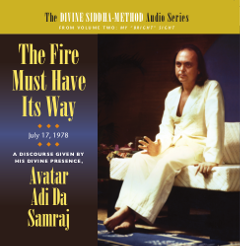 By persistently granting feeling-attention to Avatar Adi Da’s Living Divine Presence, all ego-patterns are “burned up” by His Grace—ultimately enabling egoless participation in the Perfect Ecstasy of Real God. In every moment you are tested by the Law, the demand of God, to surrender your “self”, to transcend your “experience”—not to do something in order to get another “experience”, but to transcend your “experience”, whatever it is in this moment, whatever it could be, whatever it has been. You must enter into “self”-transcending Love-Communion with the Living God. Track 1: 14:19 Have You Learned To Feel Perfectly?